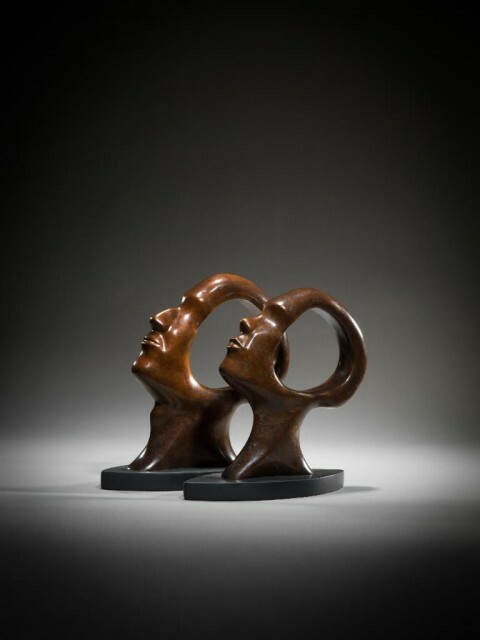 One of Britain’s leading contemporary sculptors, Simon Gudgeon has a signature smooth style that marvellously concentrates spirit and nature. His minimalist, semi-abstract forms depict both the movement and emotion of a moment captured with a visual harmony that is unmistakably his own. Born in Yorkshire in 1958, Gudgeon ‘lived deep in the countryside on the family farm, learning the essential arts of observation, evaluation and interpretation of how animals and birds behave, both with each other and man’. An impulse purchase of artist’s clay at the age of 40 led him into his new career as a sculptor, responding to what lay closest to his heart: the natural world. Since then Gudgeon has attained worldwide recognition, with exhibitions in London, New York, San Diego, Paris and the Netherlands. His works are featured in important private collections abroad and in the United Kingdom, including those of His Royal Highness The Duke of Edinburgh, TRH The Prince of Wales and Duchess of Cornwall, TRH The Duke and Duchess of Cambridge, The Duke of Bedford and The Duke of Northumberland. Gudgeon sculpts primarily in bronze, marble and granite and occasionally in glass or stainless steel. Trips to Africa, Asia and Australasia have enabled Gudgeon to broaden his subject matter and experiment with a variety of styles and methods. His pared-down approach to sculpture embodies the flowing line of the skeleton, turning it into ‘something abstract, taking away more and more information, but ... maintaining the inherent tactile core, so the form is still identifiable’. Using the smallest of details, such as the arching of a neck, he suggests rather than depicts a bird or mammal. In 2009, Gudgeon’s sculpture Isis was installed in Hyde Park, London, the first such installation there for over 50 years.